-- Select a Size -- Small - Out of Stock! Medium - Out of Stock! Large - Out of Stock! X-Large - Out of Stock! Get your pet something only an OoMa can make with love with this OoMaLoo Handmade Ball Dog Toy in 2 Tone Pink and Green! Dogs will have a ball with this Squeaky OoMaLoo Handmade Ball Dog Toy! Hand-crocheted in 100% polyester "fur," it is washable and durable. All OoMaLoo toys are hand made with care for maximum durability. The "furry" portions, made of high-quality non-shedding polyester yarn, are especially strong and long-lasting. 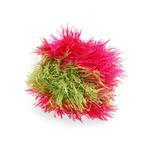 This pretty pink and green ball is available in a wide range of sizes to suit most pets. The crocheted texture provides lots of tooth cleaning surfaces as your dog mouths the toy. The smallest versions of this furry ball toy would also be ideal for cats! They will love the plush texture of this "prey." Each dog toy contains at least one industrial-strength squeaker. These squeaky balls are made of non-toxic materials exclusively for OoMaLoo. Dogs love not only the furry texture of the toys, but also the squeak. Toys are machine washable in cold water, gentle cycle; air dry only. *Please Note: No toy is indestructible. We strive to create interesting toys for your pet that are aesthetically pleasing to the owner as well. Toys are intended for supervised play by the average pet and its owner. Every attempt is made on our part to insure that our products are well made and very secure. Additionally, we suggest that owners check toys frequently for loose pieces or a pulled thread. Please enjoy them with your pets responsibly. These toys can be crazy annoying but our dogs love them! Posted On 04/01/17 by Mary Linda K from Cartersville, GA Yes, Mary Linda K recommends this product! Good products, good service, fast delivery, good solid packages, Will recommend to my friends,.